Temperament: Sensitive, affectionate, playful and alert. A sighthound in a tiny package. Italian greyhounds are an ancient breed, developed in Italy to be companions and a lap dog for women in the Middle ages, however also had endurance, speed and a desire to hunt small game. These days it is a household pet who excels in many sports and conformation. Italian greyhound breeders have expressed that autoimmune disorders are their largest concern. Autoimmune illnesses reported include (but are not limited to) Addison's disease, IMTP, AIHA, and MMM. Also of concern are epilepsy and leg breaks due to low bone density. 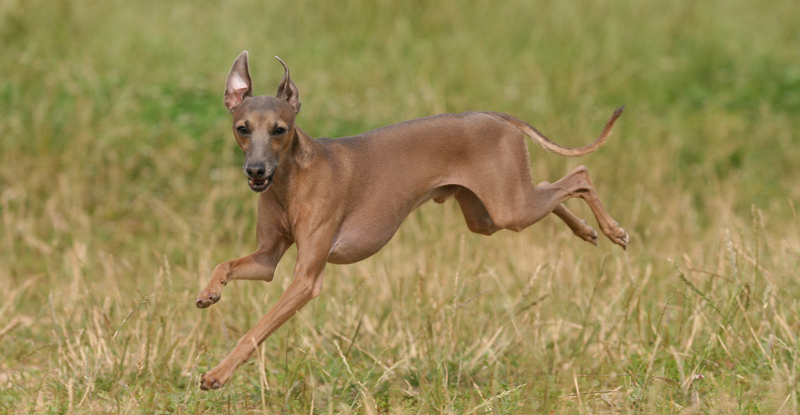 Italian Greyhounds from the United States and European countries were tested at UC Davis. Genetic analysis showed that American and European both had breed specific genetic clusters, but with very different genetics. It was found that being homozygous increased risk for autoimmune disease. The breed appears to have reasonable breed-wide diversity, but this diversity is very unbalanced. The average number of alleles in the breed is 7, however the effective alleles only 3.39. This indicates a need to redistribute alleles breedwide and presence of a bottleneck. 18 different STR-associated DLA Class I and 17 DLA Class II haplotypes have been identified to date in Italian Greyhounds. This is fairly average for a purebred population. Because it was found that homozygousity significantly increased risk of breed specific autoimmune disorders, IG breeders first and foremost should focus on breeding for an IR below breed average (.03). However, since the majority of Italian Greyhounds in the US are clustered, breeders perhaps could seek to rebalance their genetic diversity within the breed. This is achieved by raising OI above breed average and seeking a lower than breed average AGR; alternatively, seek to raise/lower these values above/below that of the sire and dam. Breeders should also seek for diverse immune systems, with different DLA types at each locus. Consideration of crossing European IGs in to the United States lines should be made, given the very different genetics within the two groups. After that, if breed health is not mitigated with these attempts, an outcross to a similar breed may be considered and warranted. Afterwards, careful management of the cross offspring and their genetics could help improve breed health.